The topic “TTIP” (“Transatlantic Trade and Investment Partnership”) lies right at the heart of current politics- and economics-themed debates. Why? A short explanation would be ‘because it affects us all’. For a more lengthy explanation and in order to explain why the TTIP negotiations have laid bare nerves on both sides of the Atlantic and across the entire political spectrum of left, centrist and far-right movements, a look at some of the issues surrounding TTIP and the positions of the negotiating parties could be helpful. The trade negotiations have been conducted in secrecy and cover such a vast range of issues that an accurate description is difficult. Greenpeace provides a useful, if slightly vague, overview with the comment that TTIP “would account for about half of the entire world’s GDP, nearly a third of world trade flows, and would affect pretty much every sector of the economy – from farming to textiles, and IT to cars”. TTIP currently appears to be a weapon utilised in debates by campaigners everywhere, regardless of whether they are located in the old world of Europe or in the new world, and regardless of whether they are for or against it. An article in the British newspaper The Guardian suggested that TTIP had become so toxic a topic that even pro-trade presidential candidate Hilary Clinton had been forced to re-examine it in order to avoid losing votes. Of particular concern is that TTIP could damage the established democracy and sovereignty of EU member states by granting sweeping powers (more sweeping powers in some people’s opinion) to corporate businesses. And, in addition, that TTIP “would lead to a race to the bottom on everything from environmental to consumer protections, forcing us down to the lower level that exists in the United States”. To name just two examples, the protection of production standards and workers’ rights are much higher in Europe than in the United States. The US position is a bit more complex and difficult to understand from a European perspective. This is because in the US different standards are widely accepted, to include, for example, genetically modified food products. The US view on TTIP sees the EU embracing the United States’ market and regulations, whereas the EU view sees barriers being removed which serve the purpose of protecting health and safety standards, an eco-friendly production of goods and so on and so forth. And in Europe? On one side of the debate, TTIP has been considered to represent a business opportunity, a vision for even less regulated and more privatised trade. Other proponents predict that TTIP will create millions of jobs, up to 200.000 of these in Germany alone. They also foresee TTIP increasing countries’ economic growth. Consequently, at the last G7 summit it was again proposed to conclude the TTIP-negotiations by the end of the year 2016, i.e. soon. On the other side of the debate, anti-TTIP campaigners view the trade negotiations as a perfect example of everything that is wrong with the EU, starting with the fact that primarily corporate lobbyists tend to be all for it and finishing with the fact that many EU citizens, feeling ignored by their supposed elected representatives in Brussels, fiercely oppose it. One of the main problems surrounding TTIP has been the fact that negotiations have been conducted in secrecy, leading almost automatically to a negative perception. This was made worse following the leaking of hundreds of pages of negotiating documents from the TTIP negotiations in May 2016 by Greenpeace Netherlands. The documents revealed that the US wished to “open the door to US producers of genetically modified food and other products banned in the EU for public health and environmental reasons”, as stated by War on Want. First there was the secrecy which led the public to believe that something was to be kept hidden from their scrutiny; now, after the documents leak orchestrated by Greenpeace, this belief has seemingly turned out to be correct. The timing could not be worse. The string of successes enjoyed by right-wing populist movements throughout Europe, from the National Front in France to the Alternative for Germany (AfD) and UKIP in the United Kingdom, has partially been a result of these parties being able to convince certain segments in society that the established political parties are not acting in the interest of the wider public, to put it mildly. The problem, then, is that widespread disillusionment with the established political parties and governments has already attracted significant support from the far-right. Now, fuelled by the perceived deception in the TTIP negotiations, both centrist and liberal-left movements in the EU may also feel inclined to withdraw support from their governments. For the sake of stability alone, any action which might help fuel the cause of the far-right populists is a really bad idea and should currently be avoided by European governments. 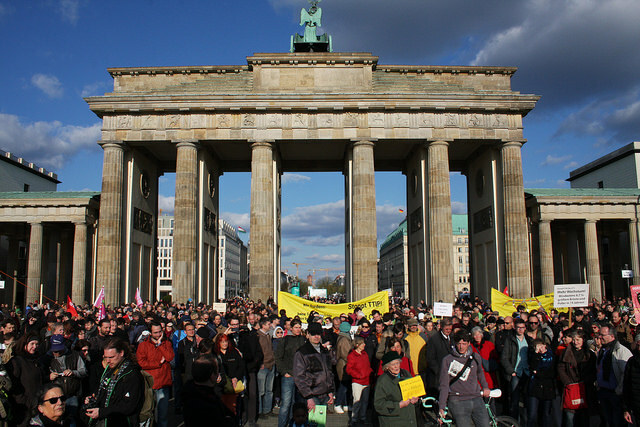 After all, people from all segments of society are joining to protest against TTIP and up to 250,000 people took to the streets in Berlin, as well as in many other cities in the EU, not that long ago demonstrating that more than just a minority do not want the alleged benefits which TTIP is meant to bring. Regardless, the EU-Commission appears adamant to carry on with the negotiations. Outlook – can a deal still be concluded? TTIP has not been officially pronounced dead yet, but in its current form the negotiating positions of the United States and the EU are simply too different to be reconcilable with one another. This conclusion seems to have been reached by the French as well, with President François Hollande stating in May that France intended to block TTIP at this stage because it is opposed to unregulated free trade. The timing of this move by Hollande can likely be attributed to a combination of public pressure and calculated publicity stunt; the key parties’ fundamentally different positions and aims must have been obvious to France from the start of the negotiations. Unfortunately, and causing a further rift within the EU, German Chancellor Merkel appears to disagree and even wants to speed up finalising the deal with the United States. Despite the current seemingly fundamentally flawed approach to negotiating a trade deal acceptable to both the United States and the EU, it should not be forgotten that underlying TTIP lies also a vision: of cooperation and free trade conducted with the aim to benefit all. It is a legitimate vision, but it needs to be accountable, inclusive and sustainable. The European Coal and Steel Community was founded on similar ideas of cooperation in 1951, except that it did not contain controversial topics such as genetically modified or chemically treated food, among other issues. But it nevertheless comprised a vision that later led to the formation of the European Union, which in turn has provided approximately 500 million EU citizens with decades of peace and prosperity. So whilst the current TTIP is not in the interest of the majority of EU citizenship, the idea of a TTIP-like format based on joint cooperation between a collective of states and expanding upon the trade framework provided by the EU should most certainly not be shelved. Bild 1: „Global Day of Action against TTIP, CETA & TiSA, April 18th 2015 (Berlin)“. Urheberrechte (Bild + Titel) liegen bei Stop TTIP und Cornelia Reetz. Lizenz: Creative Commons Attribution-ShareAlike 2.0 Generic (CC BY-SA 2.0). 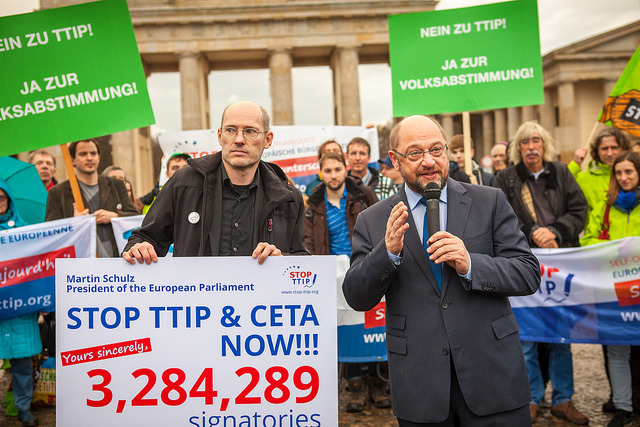 Bild 2: „Stop TTIP hands 3,284,289 signatures to Martin Schulz“. Urheberrechte (Bild + Titel) liegen bei Stop TTIP und Jacob Huber. Lizenz: Creative Commons Attribution 2.0 Generic (CC BY 2.0).